Tziganarama (Cigar-na-rama) take you on a journey through the musical styles of Eastern Europe; from the mountains of Macedonia to the Russian Steppes; from the gypsy campfires of Hungary to the Jewish ghettoes of the Ukraine, and from the forests of Romania to the cafés of Prague and Vienna. All presented in an infomative as well as humorous manner. Lots of fun... wild and wonderful. Fantastic vibe. Very charismatic and invigorating. Wild and beautiful music on the fiddle, accordion and double bass… Tziganarama will have Granny and Grandad dancing on the table, Mum and Dad weeping into their vodka, while the kids re-enact the storming of the Winter Palace in the car park! 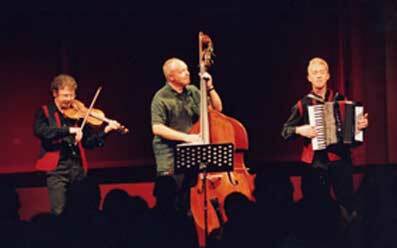 Featuring Chris Haigh on violin, Alan Dunn on accordion and Bernard O’Neill on double bass, Tziganarama have a wealth of experience of touring and recording in many different musical fields, notably with Zumzeaux and The Kimbara Brothers, as well as with a host of internationally known artists. They have played and studied with many of the Russian musicians living in, or passing through London, and can now play a wide and varied repertoire of both original and traditional east European music with authority, energy, wit and style. 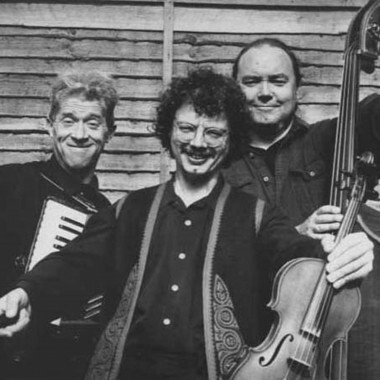 Their first album, entitled Tziganarama, featured fourteen of original tunes composed by chris, and had guest appearances from many other musicians playing such things as cymbalom, gadulka, kaval, gaida, clarinet and so on. This album is no longer available, though tunes from it continue to feature in TV soundtracks around the world, notably in Japan and the US. They give an exciting, dynamic and wide ranging live set which is easily accessible to a non-specialist audience whilst having true depth and originality. They do lots of weddings and private functions, either playing for dancing, doing background music, or sometimes going round the tables. They have appeared for the Crown Prince of Jordan at his palace in Amman, at a party in Elton John’s back garden, in front of the shark tank at the London Aquarium (for a party of Russian millionaires), and for the Lebanese mafia in a Beiruit nightclub. The line-up is flexible, and can be expanded to include other instruments such as clarinet, guitar or drums, and they can also provide cossack dancers.In fact, at the 1998 Glastonbury Festival they introduced an ecstatic (well OK, stoned) audience to the lost art of Cossack Mud Dancing! I just wanted to share [some shots] with you of our event last night where Tziganarama performed. We had lovely feedback about the group and they were a fabulous addition to the evening, with one guest even requesting their details. Thank you for once again providing such a great group of musicians and I am sure I will be in touch in the near future to see who else I can use at our many events! The closure of Soviet Gulag 724 in 1983 meant little to anyone outside of northern Siberia. But it meant a great deal to Cristov Hagelman and his two brothers. The most notorious of refuseniks – they had refused from birth even to speak a word of Russian – they had spent 30 years of forced labour practising Kalinka and Dark Eyes in every key and on every instrument from the balalaika to the cymbalom and – most feared of all – the accordion. Emerging from the camp weak, pale and disorientated, they soon found that they were unlikely to assimilate quickly into Soviet society. As members of the New Romany Zionists of Islam, they were soon in trouble with the KGB, and when they were seen playing bluegrass versions of Moscow Nights beside Lenin’s tomb, expulsion and foreign exile quickly followed. Arriving penniless in London in the final years of the Cold War, they immediately assumed new identities. Cristov became Chris Haigh, proud owner of a forged music degree from Huddersfield Polytechnic and self-styled master of the Swing Fiddle. His brother Alyanovitch became Alan Dunn, accordionist extraordinaire, whilst Big Brother Boris became Bernard O’Neill, complete with Irish passport, a double bass and a passable imitation of a Dublin accent. They then began an extraordinary and rapid infiltration into the British jazz, folk, rock and country music establishment. Alan bluffed his way into a series of folk and cajun bands ranging from Richard Thompson to the Bob Geldof Band, Loudon Wainright III and the Electric Bluebirds. Chris and Bernard entered a series of bands together including Zumzeaux, Ricky Cool’s Western Swing Allstars and the Kimbara Brothers. Bernard assumed the guise of an experienced session man, working with such artists as Andrew Cronshaw, June Tabor, Loreena McKennit, whilst Chris found himself working with Alison Moyet, All About Eve, Michael Ball and Riverdance. With the fall of the Berlin wall and the collapse of the Soviet Union in 1987, the three brothers finally felt safe enough to partially own up to their former identities. Still pale, weak and disorientated, and still refusing to speak a word of Russian, they have nevertheless resumed playing the music of their native land. They have formed Tziganarama, a band whose name is both meaningless and unpronounceable unless you have first consumed at least one bottle of pure Russian vodka.